F O O D & P L A C E S || Baumann's or Ranfield's? That is a really good question. Who knows, I don't really need an answer either way because which ever it is this place serves a darned delicious sunday lunch for two. I just hope this doesn't change that's all. You can find this gem of a place in the quiet Essex market town of Coggeshall - famously known as Baumann's Brasserie of award-winning chef Mark Baumann, it is currently in transition to becoming Ranfield's Brasserie I believe [but don't hold me to that]. Change is never easy - it's stressful establishing yourself in a community if you are the new owners, and unnerving if you are one of the extremely loyal clientele of a local foodie spot - but sometimes it's a good thing, a breath of fresh air to mark a new era. I heard a great saying this week which feels quite apt for many situations including this one: when a door closes, you can open it again. Interpret it as you like, but in this case, more delicious food might be behind that door so embrace! garlic butter bread, basil butter bread, cheese & bacon butter bread. // butter butter and more butter, mmmm it tastes so good. 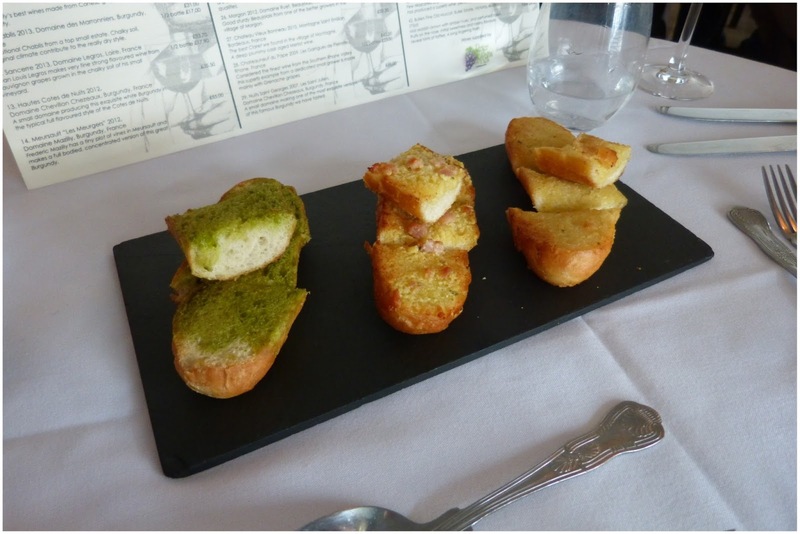 My favourite was the basil butter bread [far left] mmmm. To top it off, this cost a whole £3 for this platter to share between two. Oh the joys of leaving London for sleepy country towns. 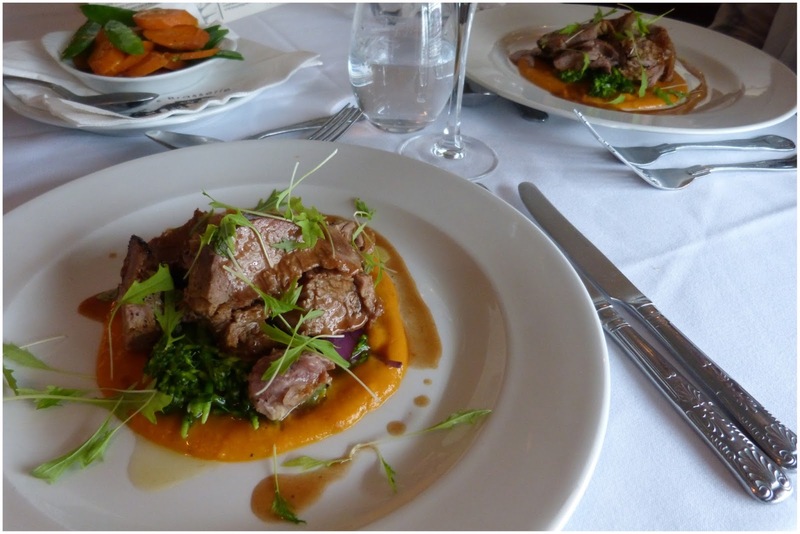 roasted leg of lamb, asparagus and sweet potato purée, with a side of roasties and mix veg. // sundays with an alternative roast should really be a thing. 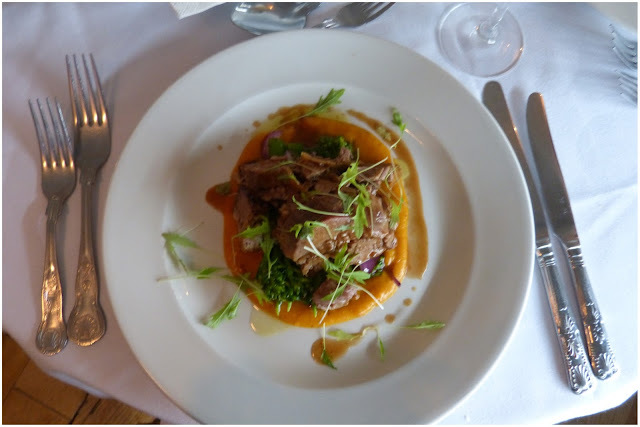 This one was just yuuum, lamb meat so tender it had the consistence of butter, perfect asparagus and sweet smooth sweet potato puree. We added roasties just to pretend we were still having a roast #spoilt. 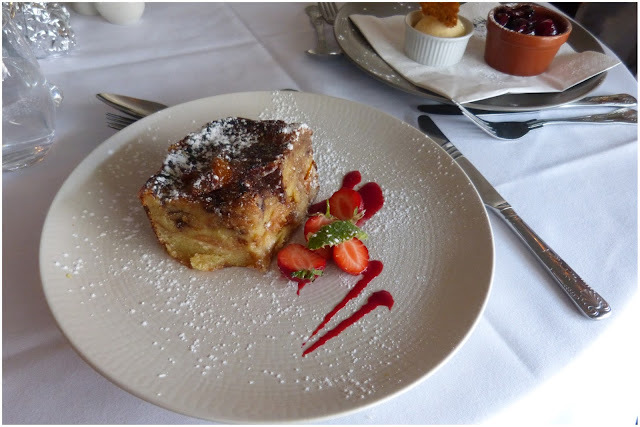 white chocolate and apricot bread and butter pudding. // I'm not really sure why I ordered dessert because I couldn't even finish my main [they made me two whole doggy-bags for my meat and my veg], but there you go the eyes of the stomach want, the eyes of the stomach get. This is was one luxe pudding as well, extremely delicious but probably the worst choice I could have made after a very filling main. The jealousy was definitely REAL when I saw the cucumber sorbets pass by… It was worth it. Just to dine here, I think it's worth going out of your way to Coggeshall if you're ever driving through this part of Essex. Just look at it, seriously. Now if only lazy sunday lunches could extend into the weekdays… Luckily they don't or we'd all be super sleepy all the time.